I had eaten dried currants long before I tried this beverage. They're very similar to raisins in taste and texture. So I guess in my mind I was expecting this beverage to taste a little like raisin juice. "But raisins are just dried grapes, you airhead," I scolded myself internally. So before partaking of this beverage, I adjusted my flavor-hypothesis accordingly and primed my tongue for something red grape juice-esque. 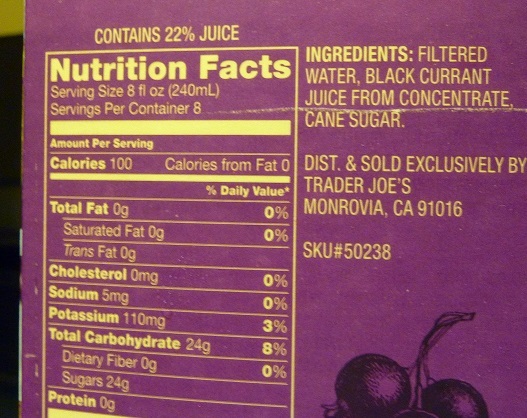 I had also been warned by the check-out girl at TJ's that she cuts her currant juice with a bit of water—so I was expecting it to be strong, too. But if anything, I would say the taste of this juice is significantly subtler than good old, traditional Welch's 100% Grape Juice. 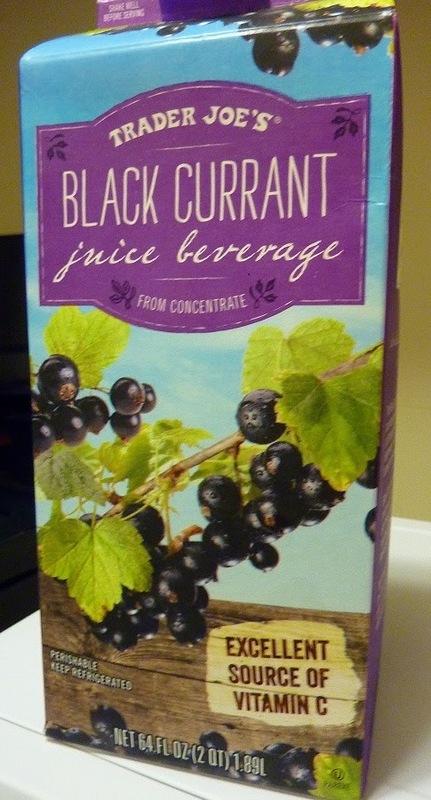 It looks almost identical to red grape juice—perhaps a tad darker. And I've never been one to cut anything with water. I'd rather have half a glass of thick syrupy juice by itself and then chase it with a separate glass of plain water. Which is what I did in this case. It wasn't so pungent that it blew me away with its tartness or tanginess, but it certainly left a bit of an aftertaste in my mouth. Not a terrible one, but any aftertaste is unwelcome in my book. However, the overall flavor is quite pleasant. It's a really refreshing and summery flavor somehow. There's an undertone that I would compare to cherry juice or cherry cider. And it's not unlike the flavor of an acaí-based drink or blackberry drink, although all three of those juices are a tad more pungent than this stuff. The only thing they add to the "juice beverage" is some cane sugar. I think they could have gotten away with just calling it "juice," but you know the true health nuts would have had a conniption if TJ's called it "juice" and then added sugar. It's not overly sweet by any means. I think if they had gone the purist route and not added any sugar of any kind, it would have turned me off. I think it is what it's supposed to be, just the way they have it...if that makes sense. Even so, in the future, I think I'll go for the stronger stuff over this one. But if you're someone who really appreciates lighter, subtler flavors, I could absolutely feature this being a beverage of choice for palates more refined than mine. I give it 3.5 stars. So does Sonia, who added, "It tastes like a diet drink, almost like a weird Crystal Light flavor." It was a sad day for me in San Diego when I found out TJ's was discontinuing this product. It was something I made special trips to get.